What to do when you realize certain unpleasant realities of this life? Jerry Lagadec pours his myriad feelings about life into his craft, “Singing in the Life Boats”—an expression on his views on aging, environmental concerns, religion, and a variety of other themes. The one common thread throughout the book is the task everyone has for creating the meaning and purpose in their lives. Moreover, readers can expect short philosophical observations (rambles) and rants on subjects that annoy Lagadec—particularly the arrogance and smugness of “true believers”. 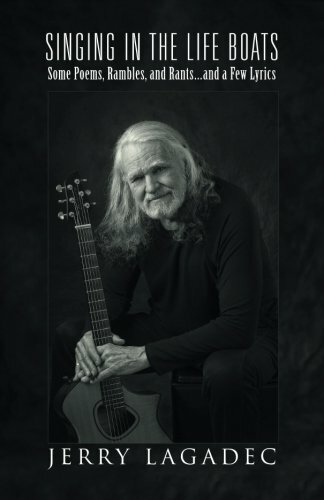 Hear the sagacity of Jerry Lagadec in his “Singing in the Life Boats” and you may yet discover a significant part of life’s whole truth or find the answers in its paradoxes. You can purchase the book on Amazon: Amazon Book Page. Jerry Lagadec was born in Paris, France in 1942. His father was in the French Republican Guard and was murdered by the Gestapo a month after the author’s birth. He knows this has left him with an almost fanatical hatred of all forms of fascism. He was later taken to the United States and attended Boston College for my formal education. He served in the U.S. Army during the Vietnam war. He volunteered to serve in Vietnam…but they sent him to Germany where he spent two wonderful years drinking beer and chasing frauleins…ain’t life strange? He’s authored a musical: Shaman [shamanplay.com] and performs live concerts of Native American Flute with his poetry. He teaches yoga at his wife’s studio: The Maha Yoga Center in Bridgewater, Ma.